Great weather for the 4th of July! Not too warm, little wind, and no rain!!! And, the water was off most of the day. Upper 80s for today and cloudy. Looks like 90s tomorrow and Tuesday with slight chances of rain. Wednesday through Friday, upper 80s to low 90s and getting hot for next weekend. Good news, no rain in the forecast for next weekend at this time. Past few days, we have had no generation almost all day. In the afternoon, anywhere between 1:00 p.m and 3:00 p.m. it’s a low one unit for one to 2 hours. Same pattern today, but tomorrow, we are going to get two units at 1:00 p.m. and then four units for four hours. Last Monday, Stan had Peter from North Carolina and John, from Rhode Island out for half a day. These salt water fly fishers had to make some quick adjustments to this trout fly fishing! Fun day on the holographic green crackleback on the sinking leaders. Jay and Derek, from Springfield fished with Stan on Tuesday. Caught a few fish on the copper dun midge, but overall, it was a tough day. 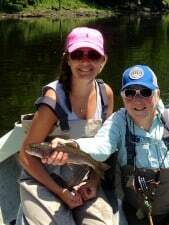 Gina and Darrell introduced Keith’s family to fly fishing last Wednesday. Gina had Kristen and Karsen. 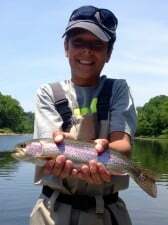 Karsen landed this nice rainbow on a size 24 P&P dropped from a Big Ugly on a 7X tippet! Way to go Karsen! Looks like a couple more fly fishers in the works! Darrell took Keith and Korey. It was the P&P midge and an egg pattern for them. Sam and his son, Nick fished with Carolyn on Friday. Pretty steady day for these two on the CQ streamer. 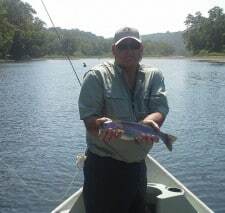 Fished and caught on the P&P midge for a little while, but the CQ was pulling fish almost everywhere we tried. Saturday, Stan had another salt water fisher and his wife on the water. Jan and Athens live in Florida. This was Athena’s first time fly fishing for trout. New experience. Copper Dun and P&P midges were the patterns for the day. Carolyn was down fishing with Mike and his family at Pointe Royale. Slow in the morning. We decided we should have stayed in bed until around 11:00 a.m. Just like clock work, around 11:00 a.m. you started seeing fish in the water and, of course, catching them. 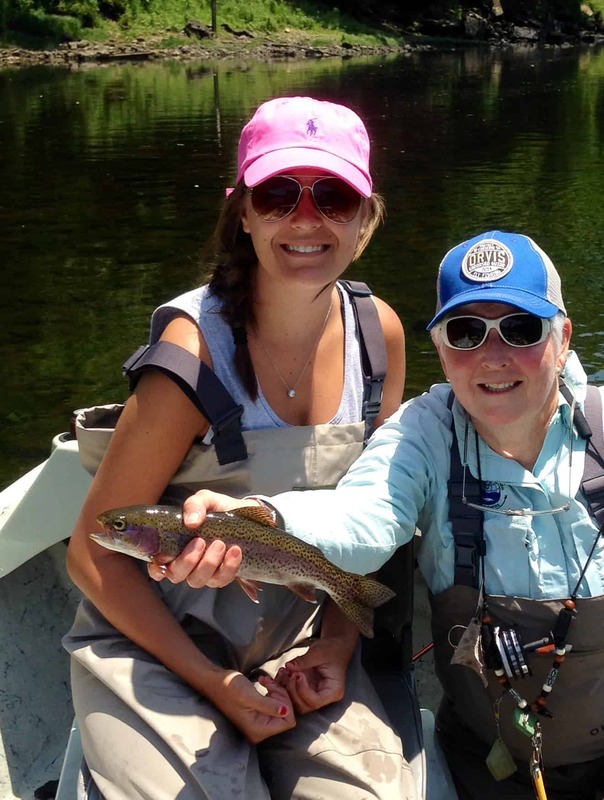 Everyone caught fish on the P&P midge, a egg pattern or a chartreuse 100th oz. jig. Fun family! This entry was posted on Sunday, July 6th, 2014 at 1:13 pm	and is filed under Fishing Reports. You can follow any responses to this entry through the RSS 2.0 feed. You can leave a response, or trackback from your own site.